Housed in a giant cage like a wild, unpredictable experiment, The End of the Particular (Perpetual Light I) has an inherent sense of danger; the laboratory result of Conrad Shawcross’s anorak enthusiasm for science. Comprised of an articulated arm, with a single light bulb at the end it rotates at a speed of 200rpm, creating a ‘magical’ hovering shape. It’s Conrad Shawcross’s larger than life diagram of String Theory, the floating illusion descriptive of the concept that matter is actually made up of continuous loops of energy, not individual particles. The blinding light line fluctuates at the precise degrees of a harmonic octave, like the graphic ‘waves’ seen on the visual output monitor of a stereo. 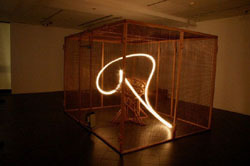 Displayed in a darkened gallery, the device works as a giant drawing machine, blasting it’s luminous patterns through the wire grid onto the walls, leaving the viewer seeing spots, like from staring into the sun. 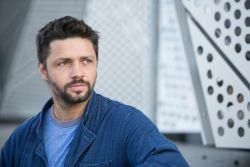 Conrad Shawcross isn’t making paintings on canvas, but rather through mechanical invention, he’s imprinting his image directly into the eye. 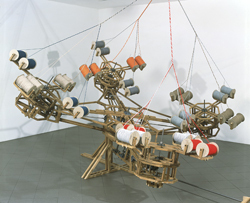 Take an impossible machine design by Rube Goldberg, a contraption built by Heath Robinson, and cross it with a junk sculpture by Jean Tinguely, and you might get something a bit like Conrad Shawcross’s The Nervous System. Ridiculously mammoth, and perilously rickety, Shawcross’s monstrous structure is a testament to Luddite technology. Handcrafted from oak timber, pieced together like a giant Meccano™ set, The Nervous System is a serious feat of amateur engineering. 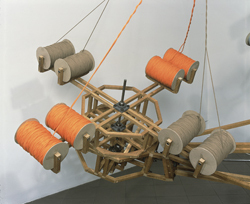 Mesmerising in its simplistic complexity, Shawcross’s sculpture offers a certain mysticism through making: beyond experiencing this sculpture as an object (with all its creaking noise and grinding movement), it is also a working spinning machine. 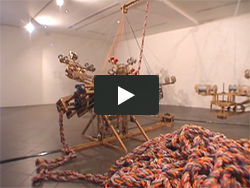 His improbable system of cogs and pulleys constantly churn out a perfectly woven rope. 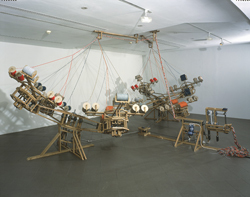 Beyond being an installation in itself, The Nervous System is also an artwork that makes art: the colourful cord pours out of the machine like paint, piling on the floor like an ever-expanding abstract sculpture.